Whew! 'Tis the last day of February, which I am glad of for lots of reasons. 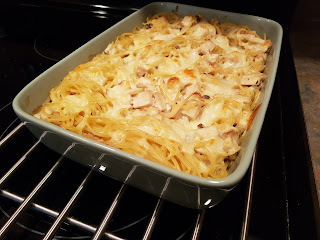 One of those reasons is now I can share with you what's been simmering in the Daring Bakers virtual kitchen this month. February was Mary's month to host the challenge for the Daring Bakers, but she graciously offered to co-host with me so I too could know the hell of hosting could have a go at choosing a recipe for all the Daring Bakers to try and enjoy. We decided that we would pick a recipe from a cook that both of us admire greatly: Julia Child. We chose her 18 page long recipe for French Bread. Yep, eighteen pages. It's not actually as bad as you may think. Yes, it's a lot of reading, and yes you have to read it more than once to make sure you understand it. It's a lot of technique, but in 7 or so hours (hey, good bread takes time!) you have one or more loaves of the most luscious, close to authentic Pain Francais, brought to you by one of the most beloved cooks to ever grace the Earth. And once you have your first taste of this bread? You'll be making plans to get started on the next batch. It's just that good. Why thanks; yes they are. And they are as delicious as they are pretty to look at. Thanks for coming by to look at my buns! And thanks to all the Daring Bakers who took part in our challenge. And an extra special, huge, gigantic Thank You to Mary. This month really was all her. She was a real champ, providing hints, tips, help, advice; hell - she even held an online baking class for the Daring Bakers! Mary, you are not nicknamed Breadwench Breadchick for nothing. Thanks for taking such good care of all of us this month. (Mary and Sara note: Other ways to get steam in the oven is pre-heat the oven and then to fill a pan with ice cubes put it on the lower rack and then pour warm water into the pan. The temperature difference between the ice cubes and the warm water will create steam. Also you can toss ice cubes on the bottom of the oven. Put a metal baking sheet on the bottom rack, pre-heat the oven with the baking sheet in the oven and right before you put your loaves in, spritz water onto the pan. Dammit! Just when I'm getting good at making bread! Calgarians will soon fork over more dough to buy a loaf of bread as several local bakeries prepare to boost their prices in the face of punishing cost increases. With soaring global grain prices, bakers have seen their flour expenses grow significantly in the past year. Wheat contracts hit an all-time high of $25 a bushel on the Minneapolis Grain Exchange, while futures hit $12.15 on the Chicago Board of Trade on Monday. Lakeview Bakery general manager Daren Hinton says previous price increases haven't hurt sales, but "there's only so much" prices can rise before customers stop buying. The situation has led some bakeries to boost the price for their baked goods and stores like Rustic Sour Dough Bakery said Monday they will charge more for bread beginning in late March. The 17th Avenue bakery's flour costs have more than doubled since last summer, from about $8.60 for a 20-kilogram bag of unbleached white flour to $17.40 per bag today. "It looks like I will have to bring in an increase," said Jos Rehli, owner of Rustic Sour Dough, who said the increase in white flour alone is costing his business about $2,000 a month. "I can't carry it anymore." Customers at the Calgary store can expect to pay about 25 cents more for a loaf of $4 bread come late March. For those who feed a large family, the prospect of rising bread prices can be daunting. Janet Woods, who buys two loaves of bread a day for a household of five people, said she is worried. "This is crazy," she said. "Between gas and bread . . . it's going to hurt." Baking Association of Canada representatives said retail bakers around the country have had to increase bread prices because of flour costs and other rising expenses including energy, cooking oil and even eggs. "Bread is a staple of the diet," said Paul Hetherington, the president and the chief executive of the association. "There's a concern about the ability of low-income Canadians to accept and accommodate these increases." The comments come as tight supplies of wheat around the world push the commodity's price to new heights. Contracts in spring wheat, which is used to make flour, hit a new peak of $25 US a bushel Monday on the Minneapolis Grain Exchange before closing at $24 per bushel -- up $4.75. Experts say the price increases are the result of a 30-year low of global wheat stocks. The world's five major wheat exporting nations have had production problems, with Australia experiencing near crop failure after a severe drought. Demand, meanwhile, has been increasing, driven in part by countries such as India and China. "The prices are very, very high, all around the globe," said Maureen Fitzhenry, a spokesperson with the Canadian Wheat Board. The board's asking price on the Canadian market Monday was $20.73 a bushel for top quality wheat, compared to about $6 a bushel for the same product one year ago. The growing wheat and flour costs have led Calgary stores like Lakeview Bakery to consider introducing another price increase for some products next month. Daren Hinton, general manager of the bakery, said previous price increases haven't hurt sales, noting Calgarians have come to expect growing costs given the city's booming economy. But Hinton said there is a limit to what the market will bear. On Monday, some shoppers at a northeast grocery store seemed resigned to the rising cost of bread. "You have no choice, so I'm not going to fret about it," said Ted Noddin, who was leaving the store with a loaf of bread. Grain prices that are tough on consumers, however, are a boon to farmers, who have struggled with low commodity prices for years. Edmonton-based Wild Rose Agricultural Producers said grain and oilseed farmers are finally getting a return on their investment after years of "subsistence farming." Here's two more recipes from our Chinese New Years Dinner from earlier this month. First off, a condiment that was included (by Kylie) with two of the dishes we made. It was so great that in addition to using with those dishes, we just put the bowl on the table so it could be added to anything or everything. Roasted Grains of Paradise and Salt. This is actually supposed to be Sichuan pepper and salt. I had some sichuan peppercorns last year, but I used them all up, and couldn't find any to buy in Kamloops. We have been using Grains of Paradise instead of pepper, so we used that instead. Place the grains of paradise (or peppercorns) and the salt in a small, heavy pan over medium heat. Cook, shaking the pan occasionally, until the grains and salt become fragrant, and the grains begin to pop. Remove from heat and let cool. Grind in a food processor or clean coffee grinder, or by hand with a mortar and pestle. It's hard to come up with words to describe how good this is. Grains of Paradise is very similar to pepper, maybe a bit more spicy. The roasting amplifies the spiciness slightly and adds a great smokiness. Really, really good. This next recipe was my very favorite of the night. But before I show you, let me share two things about the planning of the dinner. Scott was off work when we planned this dinner. So one day before I left for work I gave him the Kylie book and some paper and said, pick some recipes you want to try. When I came home that night he had chosen the perfect menu. One dish he chose really surprised me - Deep Fried Tofu. Scott is pretty easygoing, and rarely turns up his nose at what I cook or want to cook. And while he will eat and enjoy dishes I make that have tofu in them, he has never chosen a tofu dish on his own before. Progress people! The second thing - we bought a small deep fryer right before this dinner. So I think he was just looking for another dish that could be fried. My GOD was this good. I used a soft tofu, and once you crunched through the thin crispy coating the tofu just melted in your mouth. It was served as Kylie suggested with the salt and pepper, lemon and cilantro, but we also dipped it in the 4 sauces out on the table - light peanut, hoisin, soy sauce, and kejap manis which is a sweet, slightly thick soy sauce. The tofu with a bit of peanut sauce was awesome, dude. Cut around the edges of the cellophane on the tofu package and gently invert the tofu in one piece onto a plate or cutting board. Carefully and gently cut the tofu in half vertically, then cut the tofu lenghtwise and widthwise into smallish cubes. When the oil is hot (250 to 375') place the flour on a plate and toss the tofu squares gently in the flour. Carefully fry the tofu until golden brown and crispy 3 or 4 minutes. Remove from the oil and drain on paper towels. Serve tofu with cilantro, lemon and salt and pepper on the side. Ceeelebrate Good Times, Come On! In my house this month we have things to observe. The first and most recent is that one year ago today, we left for Maui. Sometimes it seems like we just got back, sometimes it seems like the trip was 20 years ago. We ate plate lunches and visited a goat dairy, we went to a luau, we celebrated my parents 40th wedding anniversary, we saw whales and swam with turtles. We ate cheese in a can, too many potato chips, and I found my favorite restaurant in the entire world. We got tattoos (real and fake), Scott spent entire days in the ocean and we had the most fun ever. I hope we get to go back one day. Our next observation - this month is the 10th anniversary of my and Scott's first date. I know! I can't believe it either. 10 YEARS. Our first date was a movie date - Titanic. Our second date was a movie and then off to play pool. Our third date was dinner out. And I wondered if perhaps I liked the wrong guy. I can't remember what he ordered, but I remember what I had - only because he hated everything on my plate. And I loved it all! What is up with that? We've had a nice birthday weekend. There were presents, tasty food, more presents, more food, more presents, grocery shopping for more food, more presents, and a trip to Costco. No wonder I'm tired tonight. I made my world famous Carrot Cake for the birthday cake this year. It was as fabulous as always. Instead of making one big cake, this year I made two little ones and six cupcakes. In the words of my beloved Ina, how gorgeous do those look? Ok, let's move yesterday's post off the top of the blog, shall we? Thanks to all of you for your kind comments. You guys are so sweet. So a couple of weeks ago was Chinese New Year. It's the Year of the Rat! We had my parents over for dinner that weekend and cooked a feast, an actual FEAST, people. It would just be too much deliciousness for you to take in one post, so I'll stretch it out over a few. 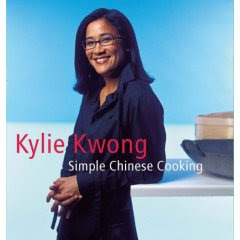 Most of our dishes came from Kylie Kwong's Simple Chinese Cooking. I got it for my birthday last year and this is the first time I'd cooked from it. I have always enjoyed her shows, although I don't think they are being shown on the food channel here anymore, which is a real shame. Anyhoo, from Kylie's book we cooked up Stir Fried Snow Peas with Garlic. Y'all should run out now and pick up some snow peas and make this dish. Lordy it was good. It takes five minutes to make which is a huge plus. I made two changes to the original recipe - I used vegetable broth instead of chicken stock, and I omitted the sesame oil, which I am not very fond of. Heat oil in a wok (or frying pan) until the oil begins to shimmer. Add salt and snow peas and stir fry for 2 minutes. Add the crushed garlic and stir fry 1 minute, stirring constantly. Stir in sugar, then pour in stock and simmer for 2 more minutes, until the peas are tender. I'm a babe! Of the bread making variety. Once upon a time (earlier this month) some lovely ladies asked me to join them on an adventure. To boldly go where none of us (or most of us, or maybe just me) had gone before; to become babes. Babes who bake bread. Bread Baking Babes! I said yes of course and there are 12 babes, all listed below. Together we will teach, learn, support and share with each other. And eat lots and lots of bread! Our first bread was picked by Karen. 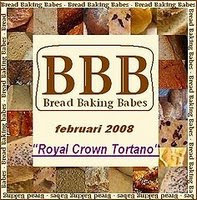 She chose the Royal Crown Tortano, which I had never heard of before. It was a two day process which would produce a large round loaf of bread with huge air holes (the recipe says air cells, which sounds nicer). The dough is an extremely soft dough, and had that not been drilled into my head - in a nice way, of course - I would have thought I'd ruined it. Although my slashes didn't come out very clearly, I was beyond pleased with how the bread turned out. It was beautiful, and rustic looking and tasted incredible. I don't think the loaf of bread lasted 2 days. Below are all the BBB's who took part this month. You should go read more about this bread, and then get started to make your own. Thanks to my beautiful Bread Baking Babes! My apologies for not posting on Sunday with the rest of you. Note about recipe: You will need to start this recipe the night BEFORE you want to bake the bread. This is the most beautiful bread Royal Crown makes, a huge round loaf filled with radish size air cells, tanks to careful handling and lots of water in the dough. Joe adds potato for flavor and moistness and honey for color to this very wet, squishy dough. For extra flavor, the bread is leavened solely by its starter, so it rises very slowly and develops a nice but not aggressive acidity. To get authentic Italian flavor, you will need to bake this bread to a deep, dark brown so don’t skimp on the baking time - the bread will not burn. By Hand: Use your hands to mix the flour and water into a rough, very wet dough in a large bowl. Cover the dough and let rest for 10 - 20 minutes. By Stand Mixer: With your hands or a wooden spoon, mix the flour and water into a rough, very wet dough in the work bowl of your mixer. Cover the dough and let it rest for 10 - 20 minutes. Fit the mixer with the dough hook. Add the pre-ferment, honey, potato and salt and the mix the dough on medium speed for 15 - 20 minutes, or until very silky and wraps around the hook and cleans the bowl before splatering back around the bowl. This dough is almost pourably wet. Unwrap the bread and flip it onto a floured peel or a sheet of parchment paper. Do not worry about damaging the bread as you handle it; it will recover int eh oven as long as it is not over proofed. Slash it with 4 radial cuts in the shape of a cross. Slide the loaf onto the hot baking stone and bake until it is very dark brown, 40 -50 minutes, rotating it halfway into the bake. Let the bread cool on a rack. Roasted Vegetable Soup for No Croutons Required. At the beginning of the month I received an email kindly asking me to take part in a new food event in the blogosphere, No Croutons Required, created and hosted by Lisa's Kitchen and Tinned Tomatos. The theme for February is simply Vegetarian Soups. I thought and thought about what to make. Should I make one of my standby veggie soups, or maybe put the vegetarian spin on a non-veggie soup in my repertoire? None of the above, as I decided it was the perfect time to pull out an as-yet-unused cookbook that my lovely Mary sent me after Scott and I moved to Kamloops last year. That sneaky girl tricked me into telling her which cookbook I was currently lusting after, and then sent me a copy of it - Super Natural Cooking by Heidi Swanson. It's become one of my most read cookbooks, and I visit Heidi's website, 101 Cookbooks, weekly. If you haven't checked it out (there might be 3 or 4 of you out there who haven't), you should. It's lovely. I had marked her Roasted Vegetable Soup to try the first time I opened the book. Tomatos, red peppers, onions (I used red) and garlic are drizzled with olive oil and sprinkled with salt and then roasted in the oven until everything is tender and beginning to brown. Then the veggies are whizzed to a puree with vegetable broth and smoked paprika, and you are ready to eat. What a great soup, and roasting winter tomatos pulls out the teeny bit of flavor they have. The smoked paprika is brilliant and really makes the soup what it is. I only had two problems - one, my garlic cloves were a little on the small side, and because I wasn't watching them closely, most of them burned and I wasn't able to use them in the soup. I can only imagine how much better the soup would have been with that extra roasted garlic. And my second problem - we ate the whole batch of soup in two days. What a delicious problem to have! Ani from Foodie Chickie is hosting her second Weekend Cookbook Challenge and her brilliant theme for February is Nigella Lawson. I love Nigella. I love her books, her show, the fact that she is not a twig sized person. I love the way she talks about food, how passionate she is. I love the sounds on her show - did you know she wears a microphone in her hair to pick up the cooking sounds? It was pretty easy to pick a recipe to make this month. I've spent a few hours flipping through her newest book, Feast, and the first recipe that caught my eye was the Chicken Caesar Cornets, chicken Caesar salad wrapped in a corn tortilla. I couldn't find corn tortillas, so I stole from my second Nigella pick, Green Eggs and Ham (ham wrapped in pesto crepes), and made the chicken Caesar wrap with a sundried tomato pesto crepe instead. Other than fiddling with finicky crepes, something I haven't made since last April, this was easy and delicious. The crepes were a beautiful color and the pesto added a flavor that went nicely with the chicken. The crepes could be made in advance and then filled up with yummy chickeny goodness when you're ready to eat. And then since I'd mastered crepes once again, the next day I made Green Eggs and Ham for lunch. I had more trouble with this batch of crepes, but a slightly mangled crepe tastes just as good as a prettier one. We found this one a bit boring, frankly, and even after we'd added some cheese it still left something to be desired. But the recipe is not a bust; it just needs more tweaking. Maybe a nicer cheese, and more of it? Want to join in the Nigella fest this month? Send your Weekend Cookbook Challenge post to Ani by February 28. Her email is foodiechickie at yahoo dot com. Make the crepes and set aside. Mix the chicken, mayo, garlic, cheese and Worcestershire together. Taste and season with salt and pepper. Stir in the lettuce. Divide the filing evenly between the crepes. Roll or fold the crepes around the filling, and eat! Lightly oil a pan heating over medium heat, and pour in enough batter to thinly coat the bottom, swirling the pan to cover. Cook the crepe until lightly browning on the bottom. Flip over and briefly cook the other side. Remove from the pan, cover, and repeat, to use up all the batter. To assemble, place as much or as little ham and cheese on each crepe as you want. Fold in to a triangle, or roll up, and enjoy. It's always fun to be offered products to try, but it's really, really great when you like the product so much that it becomes something that you purchase on a regular basis. In December I received samples of two of Campbell's new soups from their Gardennay line; the Santa Fe Sweet Corn with Chipotle, and the Field Potato with Spring Leek. When I opened the package and saw the corn soup, I had to try that one first. I like to think I made a pretty good corn soup. Well, I do, but it really is nowhere as good as this Santa Fe Sweet Corn with Chipotle. This is everything a corn soup should be. It's thick and rich, with tons and tons of whole corn kernels, and the kick of chipotle? Wow! It doesn't blow your head off, but it is definitely there, and most welcome. Another thing to love about the corn soup is the nutritional information. The container (and all the containers in the Gardennay line) contains 2 - 250 ml (about a cup) servings. Each serving has a full serving of vegetables, 160 calories, and 3 grams of fat. Not too shabby at all. It also carries the Heart and Stroke Foundation's Health Check Symbol, which means it's a healthy food choice based on Canada's Food Guide. Looks like I have a new favorite corn soup. Next up was the Field Potato with Spring Leek. This one also has a full serving of vegetables and the Health Check Symbol, and does even better in the calorie and fat department - 110 calories and 1.5 grams of fat per serving. Unfortunately Blogger ate my picture - sorry! But it was a good looking and good tasting soup. The potato soup is another thick chowder soup. The smell of it was heavenly, like potatos and cream. The taste - very nice, although I have to admit the corn soup was still fresh in my mind and beat this one as the best tasting soup. The Santa Fe soup has become a regular on my grocery list. I keep meaning to branch out and try more of the line, but the corn and chipotle....it calls to me! My verdict? These are two really, really great soups that you should try. They are good and good for you - what more do you need? I was going to do a post on the dinner that I made for New Years Eve, but then, meh. Do you need to see pictures of (extremely delicious) steaks that we did nothing to, other than salt and pepper? Or (really yummy) carrots that I have no recipe for? Especially at the beginning of February? No, I didn't think so either. But, I do want to share the recipe for the potatos that we had. Oh my, were they good. That is 6 HUGE servings. Had I known how enormous they'd be I would have made them smaller. And more of them. On another baking sheet. Between what you see here and the leftovers I ate from the "piping bag" (what? there was no more room on the tray!) I easily could have made 8 servings. They were delicious though, and the leftovers were gone within a couple of days. I made these in the afternoon and left them to chill until we were ready to eat. Very easy and very good. Bring a large pot of water to the boil and cook the potatos until very tender. Drain, return to the pot and add the butter and sour cream. Mash until smooth. Add the egg yolk and stir to combine. Add the chives and season with salt and pepper. Spoon the potatos into a pastry bag or zip bag (that's what I used, just fill it, squeeze out the air, cut off one of the corners and go to town) and pipe into 8 servings on a parchment lined sheet. Refrigerate until ready to cook. Preheat oven to 400' and cook the potatos for 2-25 minutes, or until hot and starting to brown. If you so desire, pop the tray under the broiler for a few minutes to brown. Carefully remove to plates and serve right away. I've shared the recipe for my favorite potato pancakes before, but I forgot, and last time I made them I took this picture that I thought came out rather well. I found an article on the internet a couple of weeks ago written by Peter Kelly on his appearance on Iron Chef America, and beating Bobby Flay. I found it quite fascinating. Read it here. Speaking of Iron Chefs, looks like Rob Feenie is recovering from losing his restaurants last year (well, as much as you could, I suppose); he's going to work for Cactus Club Cafe. dietlifestyle change, cheating on it less, excersizing more, less alcohol. For 40 days, baby! Laissez les bon temps rouler! * King Cake for Mardi Gras. It's Mardi Gras, aka Fat Tuesday today! Mardi Gras is the day before Ash Wednesday, which is the first day of Lent. And Lent is the 40 day period (excluding Sundays) before Easter, and is a time (for those who follow) of prayer and self denial. Meaning you would abstain from something (drinking, eating chocolate, whatever) for 40 days. Which I guess is why Fat Tuesday would be a big deal; the last hurrah before you must go without your chosen vice for 40 days. To be honest, I've never paid much attention to Mardi Gras. There are no huge Mardi Gras celebrations around here, and we do not practice Lent, choosing to keep our vices close to us all year round. Last month Mary and I baked together through the magic of instant messaging, and we had so much fun we decided to make it a monthly occasion. Last week Mary emailed me to see if I would be interested in getting together to try our hands at King Cake. Great! I said. And then Googled King Cake to see exactly what it is. There are tons and tons of different King Cake recipes, but basically it's a sweet bread dough. Some have fillings, some don't. Mary chose a recipe from Emeril Lagasse that had a sweetened cream cheese filling. So this past Sunday Mary and I met online at 8:00 my time and got cooking. Emeril's recipe - here it is for you - makes a huge cake of 20 to 22 servings. Mary - who is my baking guru; my go-to-girl for anything flour and yeast related - said I could halve the recipe. So I did. I ended up having to make the dough twice. The first time I halved everything BUT the butter and had to throw out the dough. The second time around I was still having trouble with the dough coming together, but added some extra milk. It was pretty iffy looking, but my patience was running thin, and it wasn't even 9 AM yet. I proofed the dough in the oven with the light on, as Mary has taught me to do, and after a bit of extra time the dough still looked funny, but it had risen. I rolled out the dough and spread the filling along one side, then rolled and formed the log into a ring. It was tough to pinch the seam closed, but throughout the second rising of the dough I kept pinching. While the dough was having its second rising I got my sugars ready. The two stores I checked out had a crappy selection of colored sugar - red and green only. So I made my own gold, green and purple sugars with regular sugar, food coloring and my mini chopper. The purple represents justice, green represents faith and the gold represents power. Normally a small plastic baby (representing baby Jesus) or a pecan half are inserted in the cake. Whomever find the baby or nut in their piece is the Queen or King of the party, and must prepare the King Cake next Mardi Gras. Because I am sharing this with lots of people at various places I didn't put one in. My cake baked for about 35 minutes, and then I left it to cool. My middle closed up, though. I should have made the center larger. Then I made the frosting - icing sugar, lemon juice and milk. After icing, it was time for the sugar. Luckily we didn't eat lunch that day, so I had no guilt about eating a piece. This is really, really good! The dough isn't overly sweet, so the sugar and the frosting don't push this over the top. The bread is tender, and the cream cheese filling is very cheesecake-like. I do have some gaps between the filling and dough, and that's my fault for not being more careful during the rolling. It doesn't affect the taste, of course. If you're up for a day in the kitchen, give this a try! But remember - King Cake can NOT be made before Twelfth Night or after Mardi Gras day! But don't ask me why. Thanks to Mary - can't wait to see what next month brings!